Mustang II Front End Suspension Tubular A Arms + 325 lb Spring & Gas Shock Kit. 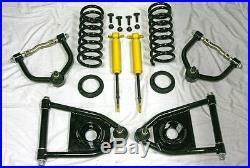 This is a brand new set of 4 Mustang 2 TUBULAR Control arms plus Front End Suspension Spring & Shock Kit and T-Bolts. These A-Arms are a great upgrade for the Mustang II front suspensions. This style of tubular arms eliminates the use of the strut rod and creates a much more solid, balanced front end. These arms are for use with standard Mustang II coil springs. They also have a mounting point for a sway bar if needed. These work great with most aftermarket crossmembers, but stock Mustang II crossmembers may need to be modified for use with these control arms. These are black powder coated and are some of the nicest you will see on the market! Again, this is for the set of FOUR. The included springs will work for most Mustang II front suspensions. They will also work with both stock A-Arms and tubular A-Arms. The spring is approximately 10-1/4 tall. These are rated at 325 pounds and are perfect for both original Mustang II applications and street rod projects. The shocks will work with most brands of Mustang II tubular control arms (including our A-Arms). Tubular A-Arms require a different shock than stock arms, so these are a must when upgrading to tubular control arms. Also included in this kit is a set of coil spring pads for use with Mustang II coil springs. These pads go between the spring and the upper shock tower. You do not need pads for the bottom. These are a must when replacing your springs, as the original cushions wear out quickly. Finally this kit also features a set of T-Bolts. This is a great kit at a great price, don't miss out on the opportunity to pick this up. 5000-1 + 8452 springs + 1pr Spring cushions 1pr Shocks w/ Bolts + T-Bolts. Please wait for us to send you a combined invoice before paying. We have discount prices on thousands of parts for your Street Rod, Hot Rod, and Custom Car or Truck. Parts are added to our store daily, so check back often for the latest deals! Plus, we have access to thousands of parts that are not listed. We do get hundreds of emails daily, so at times it may take us up to 72 hours to respond to your emails. Create listings that get noticed! With Auctiva's 1,800+ Templates. The item "Mustang II Front End Suspension Tubular A Arms + 325 lb Spring & Gas Shock Kit" is in sale since Thursday, February 2, 2017. This item is in the category "eBay Motors\Parts & Accessories\Car & Truck Parts\Suspension & Steering\Control Arms & Parts". The seller is "gearheadworld" and is located in Hudson, Iowa. This item can be shipped to United States.